In 2002, Suzuki introduced the V-Strom 1000 in a new motorcycle category, the Sport Enduro Tourer. Its running performance and packaging earned worldwide acclaim. In 2003, Suzuki released the V-Strom 650 targeting a wider range of users. This versatile model covers not only daily use such as commuting, but also weekend touring as well. With the addition of an ABS-equipped model in 2006, the V-Strom 650 has always been the best-selling model in its class. To further improve its running performance and riding comfort, Suzuki decided to develop a new model. 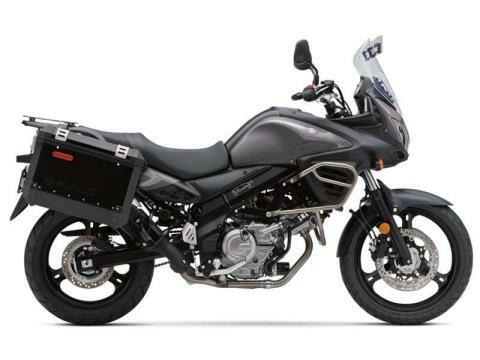 For 2015, The V-Strom 650 ABS Adventure is another choice in adventure touring. It has striking accessories that include sleek aluminum side cases large enough to fit a full-coverage helmet, a rugged accessory engine bar and an adjustable windscreen. It also has the same improved performance as the original V-Strom 650 ABS. Its 645cc V-Twin engine has improved low-to-mid rpm performance, matched by enhanced fuel economy and environmental performance. The V-Strom 650 ABS Adventure features 5-way spring-preload-adjustable 43mm-telescopic front forks with 5.9 inches of travel working with a link-type rear suspension with 6.3 inches of travel, stepless rebound damping adjuster and 5-way spring preload adjuster which can be increased or decreased by turning a knob providing a ride that suits the rider preference for comfort.